This is the Senate's version of HB2467. SB 1594 passed Senate Public Health Committee with a vote of 8 to 4 and is now on the Senate Floor in Second Reading. 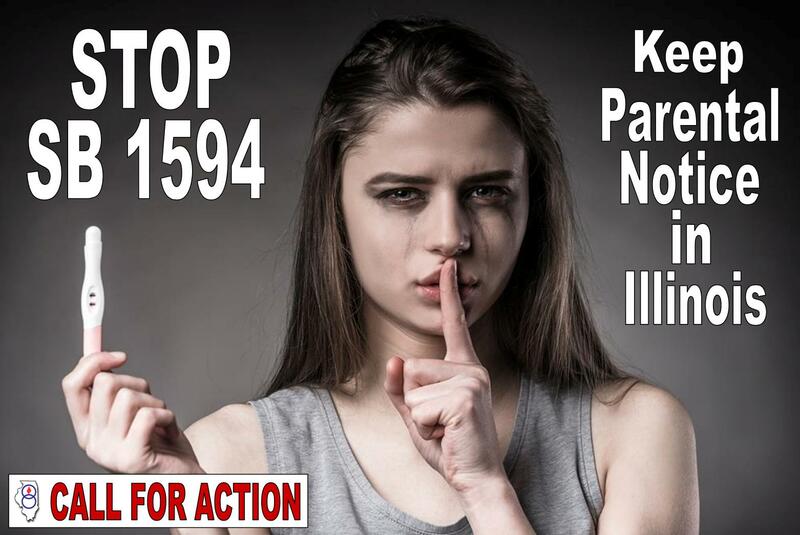 Contact your Senator, urge them to vote NO on SB1594. -Has not triggered any reported incidents of abuse or neglect of a minor as a result of notification to the minor’s parent. Missouri, Iowa, Wisconsin, Indiana and Kentucky all have parental involvement laws. 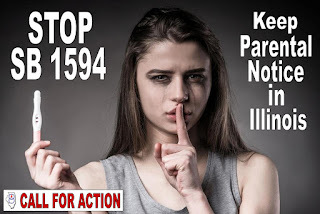 If the Parental Notification Act of 1995 is repealed Illinois will become the Midwest go-to-state for minors to obtain a secret abortion. 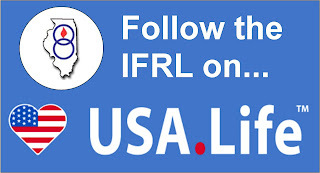 The Illinois Federation for Right to Life put forth a lot of time and effort and was instrumental along with other pro-life organizations in Illinois to pass Parental Notification. This bill has saved countless lives of babies and teen girls. Underage teens may not have all the information on making life or death decisions nor may not be aware of the effects that an abortion will have on her body or her emotional and mental state. We can't remove this important protection that was once approved of in Illinois. The Moms and Dads in Illinois do not deserve to have their parental rights undermined by their government nor teens lives endangered.